Kim de Blecourt is a media veteran, experienced writer and speaker and expert on international adoption. Kim leads a ministry called Nourished Hearts to encourage, inspire, and create community around those who are adopting/have adopted, provide foster care and/or work in orphan care internationally. In 2013, Kim joined the staff of Food for Orphans and travels with them internationally, caring for the orphaned. Kim and her husband, Jahn, have been married for fifteen years and are the parents of two children, Jacey and Jake. They reside in Michigan. Adoption is never a guarantee that the child you get will be what you had in mind, that the biological parents will actually go through with it at the last minute or that the country from which the child derives will be hospitable to your kindness. Enter a Ukraine child, American adoptive parents and the horrific ordeal that was lived through to obtain the dream of family. 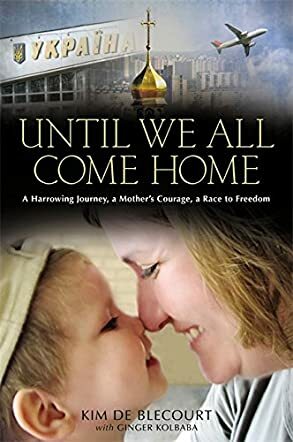 Until We Come Home: A Harrowing Journey, a Mother's Courage, a Race to Freedom is the tale of one family's perseverance and trust in God. It is the mesmerizing story of true belief in a higher power even when the world appears to be completely against this family. The author manages to put into words the joy, the heart ache, the horror and the outcome. She does so in a smooth flowing way that will mesmerize you to the point that hours and pages are the same. You will not want to put this book down until you find out what happened next..and next..and so on. I felt tremendous respect for this family who, despite the adversity, kept their eyes on the Lord and their focus on their goal. It amazes me that any person could withstand such pain and yet be so resilient to keep pushing back until that they had set out to do had come to be their reality. What a great addition to any library. What a wonderful gift for all occasions!